Rubber, something made of or resembling rubber. a traveler's bag made of carpet and widely used in the U.S. in the 19th century. Charles Green (1785-1870), was Britain's most famous balloonist of the 19th century. A mixture of carbon monoxide and hydrogen, produced by burning coal. Like hydrogen, this mixture is combustible. A volcano in Ecuador, at 5,897 meters (19,347 feet), the second highest in the country, and one of the highest active volcanoes in the world. There have been more than 50 eruptions of Cotopaxi since 1738. William Harrison Ainsworth (1805-1882) was a British historical novelist. In 1839, he wrote "Jack Sheppard", the story of the notorious English burglar and thief. William Moultrie was an American general in the Revolution. He repulsed British attack on Sullivan's Island in Charleston Harbor in 1776, and defended Charleston again in 1779. In 1837, Charles Green, Robert Holland, and Thomas Monck Mason really did take a balloon trip from London, England to Weilburg, Germany. Poe used this well known event to add credibility to his story. An English inventor who built various flying machines. In 1853, 4 years after Poe's death, Cayley designed and built a working, piloted glider, nearly fifty years before the Wright Brothers. He also invented self-righting life-boats, tension-spoke wheels, automatic signals for railway crossings, and seat-belts. Edgar Allan Poe was stationed there in Fort Moultrie from 1827 to 1828. As of the year 2000, there are 1911 people residing in the town. 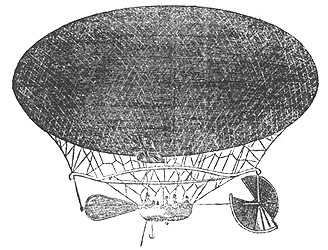 William Samuel Henson was an engineer and inventor who was familiar with the aeronautical work of George Cayley. In 1843, he received a patent on his design for a steam engine powered airplane. None of his attempts to build it were successful.